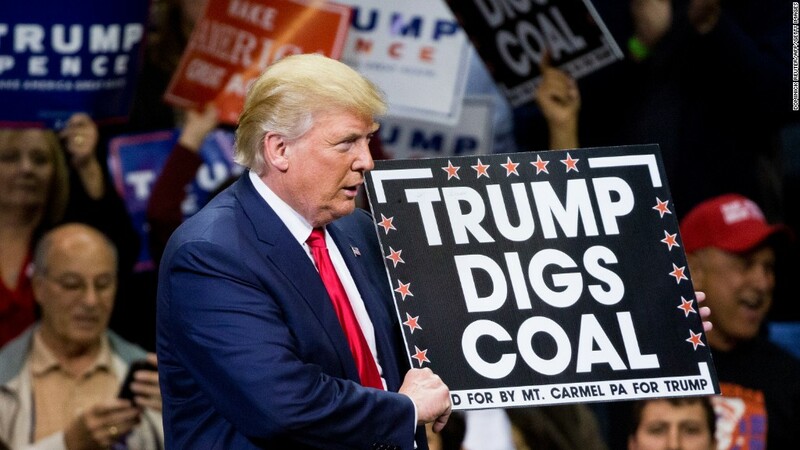 Despite many promises from President Trump that he would bring back coal jobs, the industry has only added 500 jobs, or a 1% increase, during his first year in office. And now a coal mine near the Pennsylvania-West Virginia border is due to close, costing 370 of those jobs. The mine is the 4 West Mine, owned by Mepco LLC. In a notice sent to the state of Pennsylvania last week, the company said that the mine is no longer productive enough to be economically competitive given current market conditions. It will be permanently shut. Nearly 200 of the workers will lose their jobs on March 2. Most of the remaining workers will be laid off by June 1, once they are done removing equipment. The decision is a blow for Greene County, a rural area of only about 38,000 people. The mine is the fourth largest private sector employer in the county, according to the state figures. Unemployment now stands at 5.2%, somewhat above the national average, but there aren't many jobs in the region that offer similar pay. "We're an energy county. There's a lot of natural gas drilling going on. But a gas site only has a few employees. It doesn't employ like a coal mine does," said Blair Zimmerman, chairman of the county commissioners and a retired coal miner. "Layoffs are bad, but when it comes to shutting down a mine, that's as bad as it gets." He said miners in the low-cost rural county sometimes make more than $100,000 a year thanks to overtime pay. Zimmerman said another mine in the county closed two years ago, and it's been apparent for sometime that the industry wasn't going to bounce back to its former strength. "Coal is still a good product, but natural gas is a big factor. It's cheaper and it's cleaner," he said. The county, traditionally a Democratic stronghold, went strongly for Trump in the 2016 election, with 68.4% voting for Trump and only 28.2% for Clinton. "They voted for Trump because he said he'd bring back coal. It's not happening," said Zimmerman, a Democrat. "There's not been any significant change in the industry since he's taken over." The Federal Energy Regulatory Commission rejected a proposal from the Trump administration earlier this week that would have subsidized power plants like coal and nuclear that maintain a 90-day supply of fuel on site. Energy Secretary Rick Perry argued there was a need to improve the resilience of the nation's power grid from severe weather. But critics said it was simply a bailout for forms of energy that were no longer economically competitive. Most of the members of FERC had been appointed by Trump. But the decision to close the 4 West Mine came before the vote by the regulators, so even that subsidy play probably would not have changed the industry economics enough to keep it open. Company officials did not respond to a request for comment about their closure plans.